James M Fricker Pty Ltd provides a variety of services. For graphical examples and case studies, click here. Conventional insulators like Glasswool, Rockwool, Polyesterwool, Sheepswool, Expanded Polystyrene (EPS), Extruded Polystyrene (XPS), Softwood, etc. are low density solids with high thermal resistance and these comprise BULK INSULATION. Their resistance is proportional to their layer thickness so they have relatively constant thermal properties of conductivity, resistivity, and MATERIAL THERMAL RESISTANCE or Material R (m�.K/W), the common thermal property of Bulk Insulations. The sole mode of heat transfer through homogenous bulk insulations (e.g. pine) is via CONDUCTION. With wool bulk insulations, the actual insulator is air trapped within a matrix of fine wool fibres, thus besides CONDUCTION, some heat is transferred by RADIATION. Glasswool of density less than 10kg/m3 might also allow heat transfer by CONVECTION. AIR SPACES are also insulators but their resistance is not proportional to their thickness. This is because RADIATION and CONVECTION heat transfer can dominate CONDUCTION, thus their thermal resistance varies widely depending on the application conditions (orientation, bounding temperatures, ventilation, heat flow direction, air gap, air volume shape). Thus Material R varies widely and the appropriate thermal property is Total R for specific conditions set in AS/NZS 4859.1:2002. REFLECTIVE AIR SPACES that prevent heat flow downwards are particularly good insulators as the direction of heat flow eliminates convection, the reflective surface prevents radiation, and still air is an excellent insulator (conductivity 0.026W/m.K). HOME INSULATION - MATERIAL R? TOTAL R? 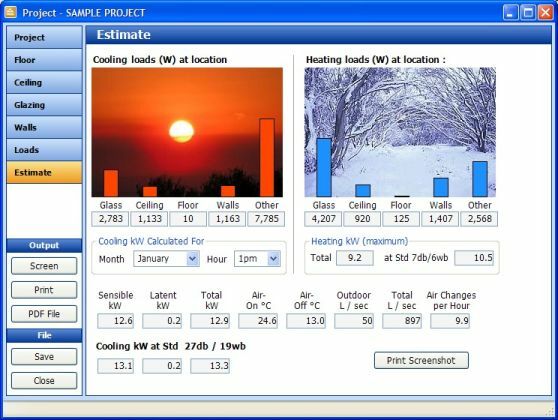 Home insulation specification should directly relate to building performance as the target is minimum heat transfer through building surfaces. The measure for this is Total R as defined by AS/NZS 4859.1:2002 - (Materials for the thermal insulation of buildings - Part 1: General criteria and technical provisions). It is the total thermal resistance through the building surface, including all the material layers and air spaces through the section, plus the indoor and outdoor air film resistances. The specification of just Material R (bulk insulation) is very limiting as it excludes the cost-effective benefits of reflective insulation. Often the most cost effective home insulation is a combination of reflective insulations and bulk insulations. Dense solids have packed molecules, so thermal conduction is higher than through contained gases. Dense solids have much lower thermal resistance than an equal air space. Still air is thus classified as a thermal insulator. But when the air is turbulent, there is very significant heat transfer (e.g. wind chill in an antarctic blizzard). The air must be still to be a good insulator. A REFLECTIVE surface reduces radiative heat transfer, so the cavity adjacent the reflective surface becomes REFLECTIVE INSULATION. 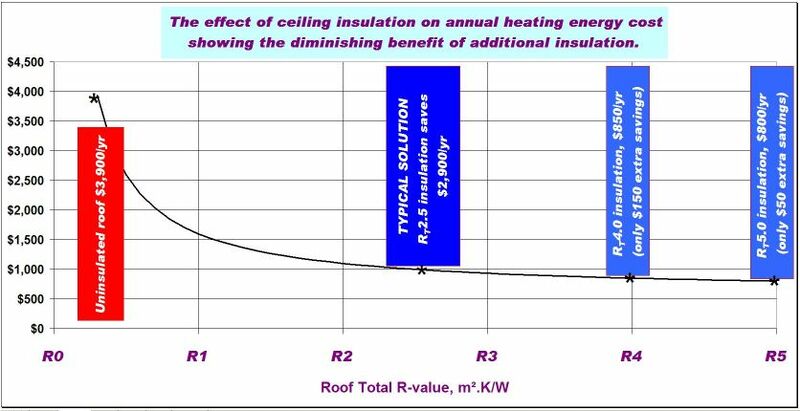 For a sealed roof attic, conduction and convection may be low, so radiative heat transfer may dominate. In such cases, the addition of a Reflective Foil Laminate (RFL) will almost eliminate the radiative heat transfer, so the AIR-GAP becomes a REFLECTIVE INSULATING AIR SPACE. The RFL may be only 0.1mm thick and have a material R-value of just 0.001 m��K/W, but its presence transforms the adjacent air space into REFLECTIVE INSULATION. Thus, the RFL ALONE is not reflective insulation (despite it being commonly claimed). It is the RFL+AIR GAP that makes REFLECTIVE INSULATION. REFLECTIVE BUBBLE WRAP has a material R value of perhaps R0.2 across its several millimetres thickness. This adds to the insulation benefit. e.g. REFLECTIVE BUBBLE WRAP+AIR GAP might be R2.2! The ONLY additional R-value due to the presence of a REFLECTIVE surface is that due to the AIR-GAP becoming REFLECTIVE. That R is a property of the air gap - without the air gap, there is no reflective benefit! These Rs are tiny because the air gap is small. Added Rs can be significant with reflective air gaps of 20 to 40mm for walls (summer and winter), and 100mm+ for floors (winter) and ceilings (summer). Variations (e.g. roof slope) may promote convection currents within the air space and reduce cavity R.
My professional specialty is state-of-the-art calculation of air gap insulation by R&P iterative calculations, and preparation of reports for building insulation certification.